At Old Waterstreet Inn, you can unwind in an atmosphere that is easy going yet sophisticated. 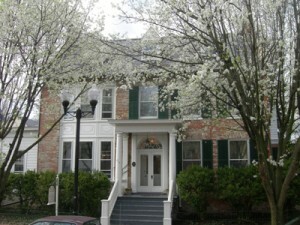 The federal style brick home, which is designated a Winchester Historic Building, was built in 1840 – 1890. Architectural details enhance the elegance of the inn, with its high ceilings, classic archways and moldings, fireplaces, lovely staircase, and built-in corner cabinets. Your hosts have decorated the inn in an eclectic mix of styles, and of old and new, which creates a charming casual ambience.